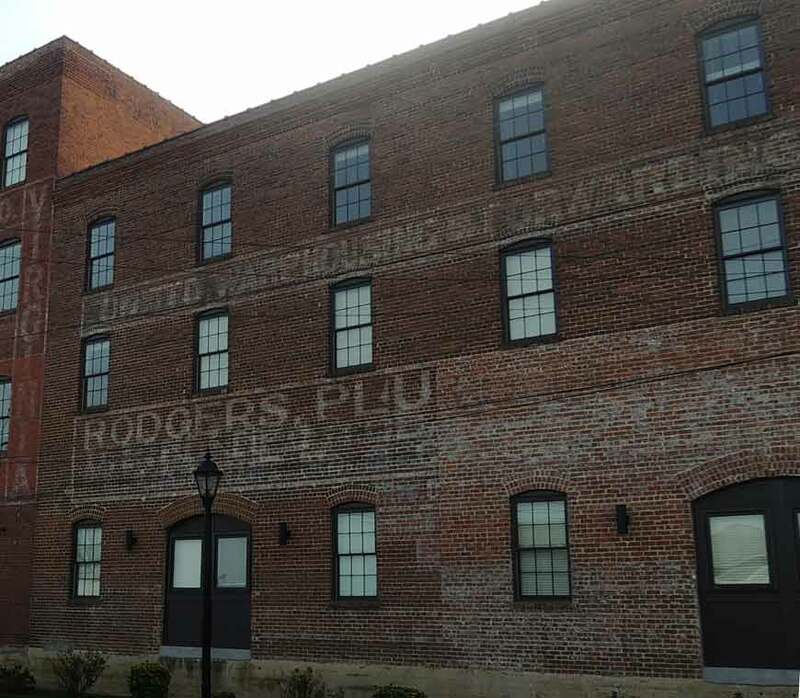 Rodgers, Plummer & Co. were founded around 1899 by John Henry Rodgers (1864-1940), and was initially J. H. Rodgers & Co., cotton brokers, located at 16 North Sycamore St., Petersburg, Virginia. A partner with John H. Rodgers was William Gordon McCabe, Jr. (1874-1953), and J. H. Rodgers & Co. became Rodgers, McCabe & Co. approximately 1901. They were cottom brokers and commission merchants located at 28-30 North Sycamore St. And they left a sign reading Rodgers, McCabe & Co / Peanuts on East Bank St. (approximately 262 East Bank) just west of the Rodgers, Plummer sign. Hill's Petersburg City Directory for 1903-04 listed Frank Turner Plummer (1875-1950) as a clerk at Rodgers, McCabe & Co. Several years later, Frank T. Plummer was bookkeeper at Rodgers, McCabe, then manager when they were located at 230 East Bank St. In 1913 Simmons' Spice Mill announced, "The partnership of Rodgers, McCabe & Co., peanut and cotton brokers, Petersburg, Va., will be dissolved Sept. 1. The firm have houses in Petersburg, Norfolk and Charleston. The business will be continued." At that point the business name changed to Rodgers, Plummer & Co. At Rodgers, Plummer the officers in 1915 were John H. Rodgers, F. T. Plummer and G. G. Rodgers. G. G. Rodgers was George Grover Rodgers (1885-1960). He was a nephew of John H. Rodgers. Also at this time the address changed to 260-262 East Bank St. This remained the case until 1921 when G. Grover Rodgers was replaced by John Talley Rodgers (1895-1983), another newphew of John H. Rodgers. It was also at this time that a branch of the business known as the United Transfer Co. was formed. United Transfer, also known as the United Warehousing & Forwarding Co., involved Frank T. Plummer and John T. Rodgers. In 1927 United Warehousing & Forwarding was listed at 300 East Bank St. In 1939 Rodgers, Plummer and United Transfer were also listed at this address. It is possible that the surviving signs date from around this time. On John H. Rodgers' death (in Norfolk, Va.) in 1940, Frank T. Plummer became president and John T. Rodgers secretary-treasurer. The business closed somewhere between 1943 and 1948. In 1942 John T. Rodgers registered for the World War II draft when he was employed "Government, Camp Lee, Prince George, Va." His death certificate (1983) recorded his occupation as "Retired Customs Inspector, US Government." This ad for Rodgers, Plummer & Co. appeared in The Peanut Promoter, December, 1920. John H. Rodgers' early partner, W. Gordon McCabe, went into business for himself in Charleston, S. C., as a cotton merchant and successor to Rodgers, McCabe & Co., as witnessed by this ad from the magazine called Our Navy published January, 1916.